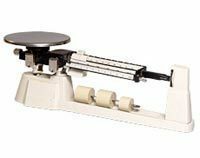 Triple beam balance the classic weighing instruments for class room instruction, these balances provide accurate results year after year. Weigh anything -liquids, solids or live animals. Spring loaded zero adjuster compensator and magnetic damping are provided. It is a beam balance with the work of boyle law apparatus . We are a remarkable entity in this domain, engaged in offering a qualitative assortment of Balance Triple. Backed by a team of adroit professionals, we are manufacturing, exporting and supplying an extensive array of Beam Balance. 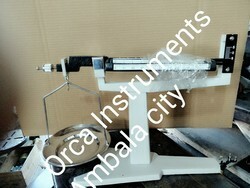 Specification as triple beam balance C-24 but this balance also incorporates facility for tarring up to 225g. - ACCESSORY: - Support rod for Specific gravity measurements suitable for C- 24 & C- 26 available at extra cost. A single pan, low form balance that has three beams with center indicating sliding masses giving total weighing capacity of 610 gm. The capacity can be extended to 2610 g. With supplementary masses. Spring loaded zero adjust compensator and magnetic damping are provided. Stainless steel pan is of 150 mm diameter.